Blame It on the Machines? In the 150 years since Confederation, the average income per person in Canada has increased about 20-fold after adjusting for inflation—all because we have adopted better ways of doing business. This illustrates the basic economic reality that productivity growth is the only game in town when it comes to raising the economic and financial well-being of people over a long period. The Bank of Canada updated its estimates of potential output growth in last week’s Monetary Policy Report. Our best estimate is that potential output will rise by an average of 1 1/2 per cent per year over the next few years—that is not very impressive relative to history.2 We are counting on gains in productivity to deliver fully two-thirds of that growth. And we are not alone; productivity performance in other industrialized countries is also underwhelming. The good news is that Canada has the opportunity to make up for lost time. The world is on the brink of a new industrial revolution. Innovations in artificial intelligence, robotics and other fields could give productivity a big boost by automating an expanding range of tasks. Some analysts predict that close to half of all jobs in some advanced economies will be profoundly affected by automation in the next 20 years. That leaves many of us wondering about the future of work. And it’s personal. We wonder what will happen to our own jobs or those of our friends, or what our kids should study to succeed in tomorrow’s workplace. Business people like you share a stake with the Bank of Canada in these matters. So I am pleased to have the occasion to speak on this subject today, and I thank the Toronto Region Board of Trade for the invitation. We can expect a future with work for people, not just for machines. Innovation is always a process of creative destruction, with some jobs destroyed and, over time, even more created. We have seen this process in action throughout modern history. What will change is the types of workers that will be in demand. We will need people with highly technical skills to program and repair the technology. We will also need people to perform tasks that may never be replicated by a machine because they require creativity, intuitive judgment, inspiration or simply a human touch. Canada should embrace new technologies and their benefits, while proactively managing their more harmful side effects. Policies that help businesses and workers manage what could be a difficult transition are essential. So are policies that address the potential for amplified income inequality and, in some cases, increased market power. The Bank’s job in all of this will be to foster the macroeconomic conditions that will help Canada adapt and grow. Let me dive right into my first point. In the past couple of centuries, the world has seen revolutionary innovations like the steam engine, the combine, the jet engine and the assembly-line robot. The resulting increases in productivity gave us a 20-fold increase in real income per capita in Canada over the past 150 years. Our underwhelming productivity performance since the early 2000s has cost us dearly. If productivity had continued to grow at the pace it did in the late 1990s, our gross domestic product (GDP) would have been 23 per cent higher in 2016, meaning an extra $13,000 for every Canadian. Even as we see the benefits of technology, many of us feel uneasy about what automation could mean for workers. Fears of technological progress are as old as technological progress itself. Now, there is no doubt that technological improvements have eliminated jobs at the sectoral level. Take manufacturing, for instance. Innovations such as industrial robots have reduced the need for workers in that sector. If we were to roll back the clock on Canadian manufacturing productivity to what it was 20 years ago, three-quarters of a million more people would have been needed to produce today’s level of output in that sector. But the manufacturing jobs lost were offset with gains elsewhere. Roughly 82 per cent of the prime-age population is now employed, about 13 percentage points higher than 40 years ago. Other past technological advances did not lead to a sustained rise in overall unemployment either. Let me use agriculture to illustrate the economic mechanisms that have helped us adapt and thrive in the past, which are often underemphasized. Factory farming and the combine harvester increased labour productivity in the farming sector and reduced the need for agricultural workers. Higher farm productivity also made food cheaper for all consumers, leaving them with more money to spend on other goods and services. These positive effects on income led to higher consumer demand, which helped spur the creation of new jobs outside of agriculture. Rising productivity in manufacturing also led to widespread industrialization, which attracted labour from farms to higher-paying factory jobs. This is how agriculture went from representing more than one-third of all jobs in Canada a century ago to less than 2 per cent today, without creating a permanent jump in unemployment. Governments helped ease the transition away from agriculture by making some bold decisions. One example is promoting education in the late 1800s and early 1900s through publicly funded schools. This helped prepare the next generation for jobs outside the agricultural sector, although the period of adjustment could not have been easy. This leads me to my second point. Technological advances have always been a key driver of growth and rising income per capita, yet some fear that this time will be different. In the past, automation was largely restricted to simple manual or procedural tasks. Today’s technology makes it possible to automate an increasing number of cognitive and non-routine tasks across a wide range of industries. Machine learning is one way to do that. Feeding computers large sets of data teaches them to mimic the human brain’s ability to infer rules from previous experiences and adapt to changing circumstances. Artificial intelligence (AI) allows computers to read scans and x-rays with precision and self-driving cars to react to any number of unique situations on the road. AI also allows businesses to automate many of the routine cognitive tasks performed by accountants, investment advisors and lawyers. Even so, it is difficult to imagine that the adjustment mechanisms I described earlier are now obsolete. An intuitive way to think about it is to observe that people’s spending appetite tends to grow along with productivity. With 20 times more income, people would only have to work 20 times less than they did before to earn the same amount. The reality is that people generally work a little more than half the time that they used to, with the rest of the gains going toward increased consumption.4 This phenomenon is observed not only in Canada but also in other advanced economies. As technologies raise productivity, labour market dislocations occur over the transition period, but eventually new jobs are created to supply the goods and services that people buy with the extra income. The fact is that we do not know exactly which new sectors will be important employers 50 years from now. Who in the early 1900s could have imagined the boom in health care, tourism and software development jobs? There are also many tasks that machines will not be capable of doing any time soon. An academic expert in this area of economics, David Autor, maintains that humans will likely retain an advantage in jobs that require interpersonal interaction, flexibility, problem solving and common sense. These include personal care workers, plumbers, consultants and, I am hoping, central bankers. The hollowing out of the middle could be further accentuated by automation.8 Moreover, the polarizing effect of technology on income distribution could be heightened by a winner-takes-all effect—this comes from the market power that new technologies can often bestow on their inventors. In parts of the information and communication technology (ICT) sector, economies of scale such as network effects are already prominent. That said, for all the hype around the current wave of automation, we have yet to see the kind of productivity growth that is consistent with a technological revolution. While we sometimes see fast technological change in specific industries—fracking in the oil sector is one example—economy-wide technological transitions often play out over long periods. After the first central power station opened in the 1880s, electrification took four decades to have an impact on productivity in the United States. Power grids had to be built, machines had to be replaced and new applications took years to develop.9 For similar reasons, it could take many years for self-driving vehicles to completely displace human-driven taxis, trucks and buses. The length of the transition will depend on how fast existing vehicles depreciate, prices for the new technology decline, and required infrastructure is updated. The Bank of Canada has a research program to better understand these issues. We have created a new digital economy team that focuses on how automation is unfolding and affecting the economy, including inflation dynamics and the transmission of monetary policy. We are reviewing the measurement issues that are exacerbated by the proliferation of digital and services-oriented technologies.11 We are also developing our macroeconomic models to better account for changes in the distribution of income and wealth. To get the most out of the new technologies, we will need to work together to proactively mitigate the more harmful side effects that I have mentioned: the transition period and the potential effects on the distribution of income. There are many promising approaches to managing the first side effect—the transition period. Let me highlight just one. As with previous technological transitions, education, skills training and continuous learning will be key. Universities across Canada are working with students and businesses to bring the best ideas in science, machine learning and AI to market. A great local example is the Rotman School of Management’s Creative Destruction Lab.14 A positive aspect is that students will gain practical experience early on. Canada and its fellow G20 countries have committed to supporting strong, sustainable and inclusive growth. Today more than ever, it is important to preserve the gains that have been made. Trade is a great driver of productivity, and so the risk of growing protectionism concerns me.15 More open trade with the United States and Mexico in the 1990s gave Canadian firms access to much bigger markets and therefore greater incentives to invest—in both physical and human capital.16 Disrupting supply chains and reducing incentives to compete will not create more jobs and income in the long run. Canada remains committed to free trade and the most recent example of that is the interprovincial agreement that was signed earlier this month. While we will not know its full impact for some time, we flagged it as an upside risk to productivity in our April Monetary Policy Report. The second side effect, distribution of income, is equally important. While gains in productivity will increase the size of the pie, there is no guarantee that these gains will be evenly distributed. This is the purview of governments, who can use tools such as taxation and transfers to address these issues. And they involve difficult trade-offs related to preserving the incentives to invest while also avoiding increased polarization of income. Cross-border taxation will also be challenging, given how easy it can be to move intellectual property to low-tax jurisdictions. Aside from taxation, increased market power for some players may raise important systemic issues, many of which are cross-border in nature. These issues are likely to arise in sectors where barriers to entry or economies of scale are prominent. An example that is top of mind from my work on fintech issues is related to cloud computing and storage. As we move away from decentralized on-site storage and computing systems, we may see a trend toward greater concentration in market structure. These service providers are largely outside the regulatory framework, and this raises issues related to adequate legal foundations, governance, transparency and risk controls. All of these are critical to a stable economic foundation for workers and businesses. As a central banker, I care about income inequality, even if we do not control the tools to address it. Worsening income inequality can lead to weaker macroeconomic outcomes and financial instability.17 It is more difficult for people with low incomes to weather economic shocks. If we see an increasing proportion of people at the lower end of the income distribution, recessions and other negative events could result in more financial stress. Shifts in income distribution can also affect the transmission of monetary policy since interest rates do not affect everyone in the same way. For example, people with lower incomes are likely to be sensitive to interest rate changes because of the potential effects on their employment income and their debt-service costs. These effects may be less prominent at the other end of the income scale. That said, people with higher incomes and higher net worth tend to be sensitive to the impact of interest rates changes on asset prices. An increase in income dispersion, then, could alter the channels through which monetary policy actions affect the economy. The Bank of Canada’s monetary policy accomplishes a simple, yet vital, task: it manages the level of demand over the business cycle in order to meet our inflation target. In turn, an environment of low, stable and predictable inflation allows productivity-enhancing investments in physical and human capital. This is the perfect complement to the structural policies that governments at all levels in Canada are working to strengthen. If we want to continue to prosper, we have to improve our productivity. Clearly, blaming the machines is not the way forward. If we seek out and embrace new technologies while successfully managing their harmful side effects, we will create inclusive prosperity. That means proactively managing the transition period and the longer-term implications for the distribution of incomes. In many respects, we have a head start in Canada. Our policy-makers are working to implement measures that will achieve strong, sustainable and inclusive growth. What you can do on your side is equally ambitious: keep building competitive and dynamic businesses; keep the collaboration going between educational institutions and companies; and keep sharing your good ideas with policy-makers. The Bank of Canada will continue to focus on what it does best: supporting the economic and financial well-being of Canada by achieving low, stable and predictable inflation; by keeping core financial market infrastructure safe; and by giving sound advice on financial sector policies so that vulnerabilities do not get in the way of sustainable, productive growth for all Canadians. I would like to thank Rhys Mendes, Ben Tomlin and Stephen Murchison for their help in preparing this speech. 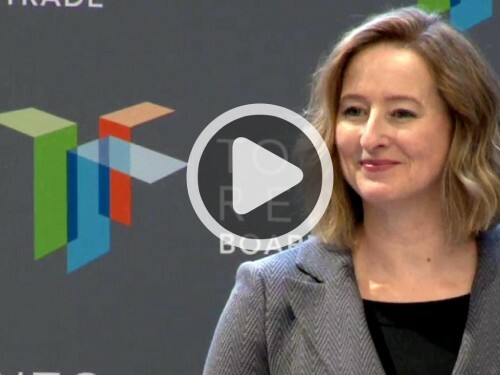 Automation, artificial intelligence and other innovations will benefit the Canadian economy by boosting productivity and living standards, but they could also have less desirable side effects on the labour market and income distribution that will have to be managed, Bank of Canada Senior Deputy Governor Carolyn A. Wilkins said today.